Plagiarism Today is intended as a free resource to help content creators of all stripes protect their work and defend against plagiarism. This site is a free resource and will always be a free resource. 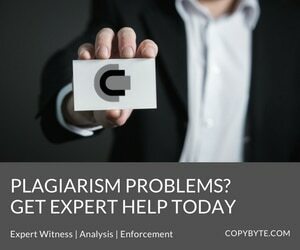 However, if you want more hands on or personal assistance in protecting your work, I am happy to provide consulting services through my copyright and plagiarism consulting firm, CopyByte. Through CopyByte I provide assistance to content creators, content buyers, web hosts, schools, lawyers as well as groups seeking public speakers. Content Detection: Locating where content has been posted online. Content Removal: Removing infringing material. Anti-Plagiarism/Piracy Strategy: Devising plans to help fight infringement before it starts. Plagiarism Analysis: I provide analysis in plagiarism cases (academic and legal) to determine if a work was plagiarized and provide reports and testimony on my findings. Case Building: Though I am not an attorney, I provide assistance to attorneys in building copyright infringement cases, including expert witness testimony. In short, if you want to manage your own copyright and plagiarism needs, Plagiarism Today should have all of the information you need. However, if you want help with those issues, visit me at CopyByte and contact me there to start a discussion on how we can help. The initial consultation is free so there is nothing to lose.